The Beast carries half a million immigrants from Central America to the U.S. border each year. There’s a network of freight trains that runs the length of Mexico from its southernmost border with Guatemala north to the United States. In addition to grain, corn or scrap metal, these trains are carrying an increasing number of undocumented immigrants who aim to cross into the U.S.
And despite the many deadly challenges it poses, more and more children—both with adults and alone—have been risking the journey. That prompted President Obama this week to warn of "an urgent humanitarian situation." These aren’t passenger trains; there are no panoramic windows, seats or even a roof to guard from sun or rain. People call the train La Bestia or The Beast. Some call it the Death Train. It's estimated that up to half a million migrants now ride The Beast each year, sitting back-to-back along the spine of the cars, trying not to get knocked off their roof-top perch. 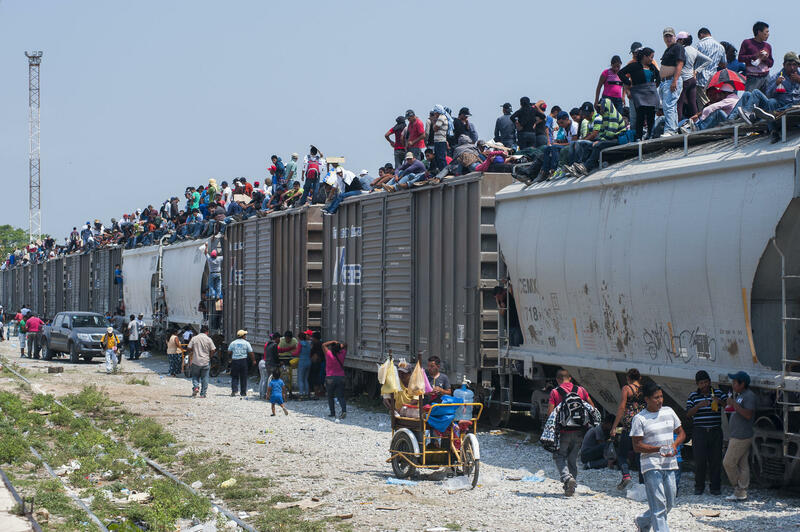 For the International Organization for Migration, he recently documented the exploding number of migrants riding these trains--more and more of whom end up in South Florida these days. Journeys on the train can take anywhere from a week to several months, and many migrants have made this trip more than once. Lis-Marie Alvarado, who lives in Homestead, rode The Beast last year as part of an Al Jazeera America TV series called “Borderland.” She and five other Americans traced the journey of immigrants who died while making their way to America. Alvarado is herself an immigrant from Nicaragua and the only U.S. citizen in her family. Many Beast riders have suffered physical injury or death falling off the train or getting sucked into the wheels trying to board it in motion. In some areas, that's the only way on. Most of those making this 1,450-mile trek are not from Mexico. They come from Central American countries like Guatemala, El Salvador and Honduras, which has the world's highest murder rate. One of the things that struck Dannemiller while documenting the Beast was just how many kids were riding the train. Instead of merry-go-round horses, kids from these countries are hoisted onto the back of this metal beast that’s just as likely to spit them out as it is to shepherd them safely to the border. In 2011, U.S. border patrol detained around 6,800 undocumented children. In 2012, that rose to 13,000; last year it was 24,000. Most estimates predict more than 60,000 minors will be detained this year alone. Some attribute this crisis, the reason people are willing to risk their lives on a train like The Beast to the United States. Genevieve Wood articulated this in her most recent installment on The Daily Signal, an online publication from the Heritage Foundation, a conservative think tank. She believes it is that illusion--sometimes fatal--that drives people to make this journey to the U.S.
Alvarado rejects this idea. She believes those making the journey, even the kids, don’t wear rose-colored glasses as they board the train. They know the dangers, the odds and the possibility of being deported later, even if they make it across the border. PHOTOS: See Keith Dannemiller's Images of "The Beast"
"Borderland" can be seen on the Al Jazeera America channel. The original version of this report was published on May 13 2014. PortMiami has finally opened its new, billion-dollar tunnel. It’s the jewel of a $2 billion port makeover, which includes a major dredging project and skyscraper-size loading cranes for sending a lot more auto parts to Brazil and getting a lot more handbags from China. But the long-term success of that effort may depend to a large extent on whether a quarrel gets solved a thousand miles to the south. In Panama. Panama Election: Is President Martinelli Pulling A Fast One? The Panama Canal is expanding, but is Panama's democracy shrinking? The country is holding a presidential election on Sunday, May 4 -- and there are growing concerns that right-wing President Martinelli is trying an end run around the constitution. Six U.S. crew members of the Aqua Quest, a 65-foot ship out of Florida, have been sitting in a jungle jail in Honduras for almost a month now. The charge against them: bringing weapons into the violent Central American country illegally. But the case is questionable – especially since Aqua Quest International, the Tarpon Springs ocean exploration and recovery company that owns the vessel, was invited by Honduran officials to carry out development projects like river clearing.